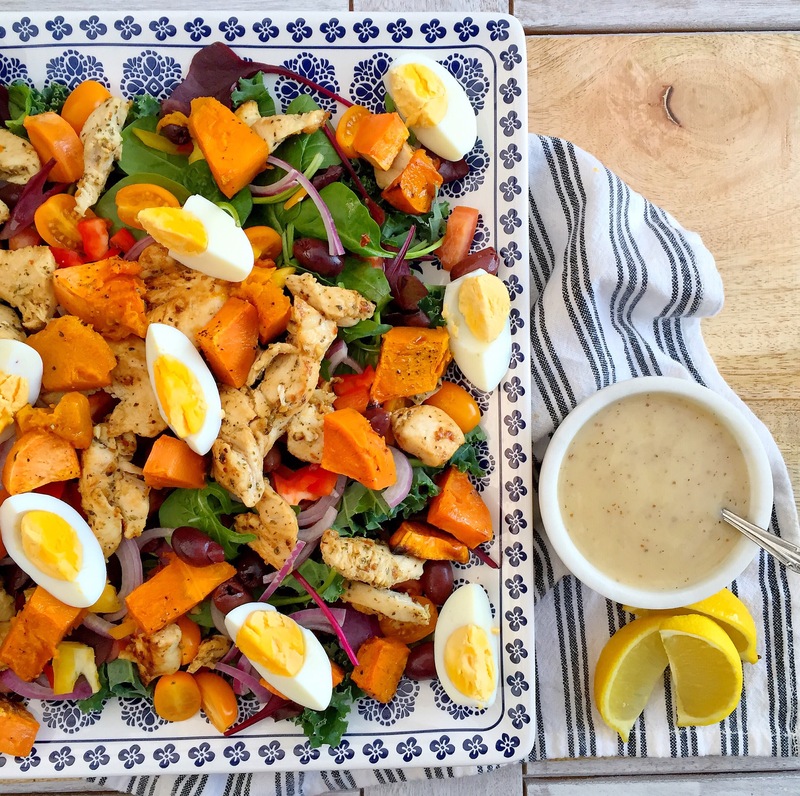 If you’re looking for a delicious healthy chicken salad, then this recipe is perfect for you! It’s been approx 21 weeks since i have given birth to my lovely number 3. I’ve decided its time to get back into shape. This time round i was super lucky with hardly gaining any weight with my little boy. The whole pregnancy was different! whereas, with both my daughters i gained 20Kg+ each leaving me looking like a complete beach whale. I give a HUGE thanks to my mummas genes though. I was able to lose the weight real easily which is something my siblings and I share all thanks to mum! She had 9 children and you wouldn’t even guess when looking at her. I only pray my little girls also become lucky like i did. For this time i used Paul Newman’s dressing. However, if you would like to make your own its quite simple. 1.) In a bowl combine chicken and marinade ingredients. Mix well, cover and place in the fridge for 1 hour prior cooking. 2.) In the meantime, roast your pumpkin and sweet potato. I drizzled them with olive oil and seasoned with salt and pepper. 3.) Boil eggs and prepare remaining salad vegetables. 4.) Once all components are cooked and ready-Assemble your salad. super easy & absolutely delicious!